Most searches for services fall into a relatively few categories. 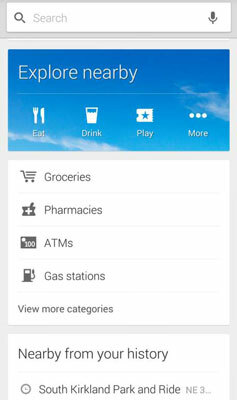 Your Samsung Galaxy S 5’s Map application is set up to find what you’re most likely to seek. By tapping the Search icon, you’re offered a quick way to find the services near you, such as restaurants, coffee shops, bars, hotels, attractions, ATMs, and gas stations. 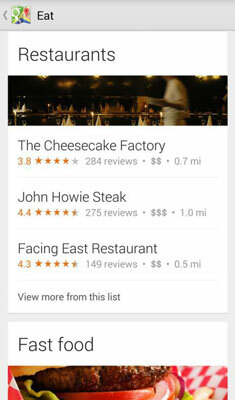 Just tap one of the topical icons, and your phone performs a search of businesses in your immediate area. 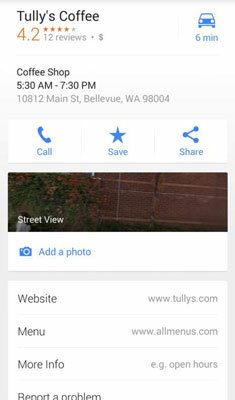 The results come back as a regular Google search with names, addresses, and distances from your location. Then tap one of the options to see more details on that business. Map: Tap to see a map of where you are in relation to this business. Directions: Tap to get turn-by-turn directions from your location to this business. You might need to download Google Maps Navigation to your phone to get the turn-by-turn directions. This is a free app from the Play Store. Call: Tap this to call the business. Street View: See the location in Google Street View. As shown at the bottom of the detailed results of a service selection, Street View shows a photo of the street address for the location you entered. Reviews: This includes all kinds of information about how people have experienced this location. More: Run another Google search on this business to get additional information, such as reviews from other parts of the web. Just how deeply you dive into using this information is up to you. In any case, having this kind of information when you’re visiting an unfamiliar location is handy.